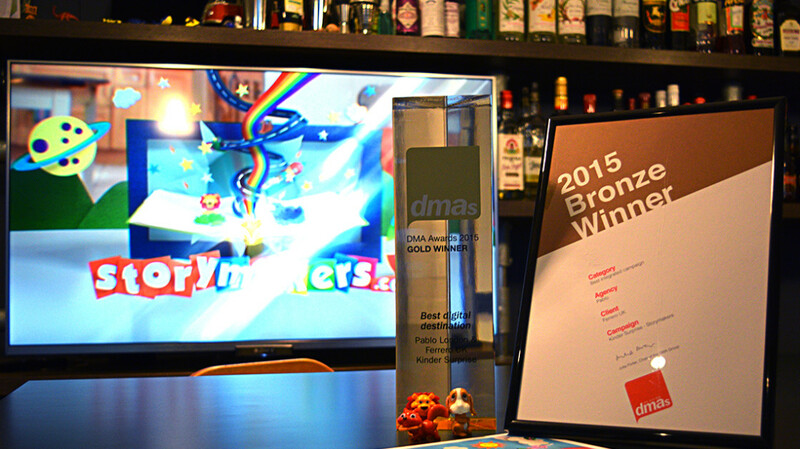 It’s always great to be awarded for your work and the DMAs are no exception. Earlier this month, Pablo added some glassware to the shelf with our work for Kinder Surprise taking both a Gold and Bronze award. Judged equally on creativity, strategy and results – the DMAs laud themselves as being ‘ rewardingly hard to win’, so to be recognised in both the Best Digital and Integrated categories is fantastic news. The Storymakers campaign for Kinder Surprise stretched across TV, online and was also promoted on pack, as well as through partnerships with the likes of Mumsnet. The beauty of the campaign came through aligning Kinder Surprise with the magic of childhood; the ability for children to learn and develop by creating their own stories and adventures; as well as families making more of story time. We’re so pleased that Pablo and Ferrero have been recognised for the success of the campaign – a huge well done to all involved. Off the back of its considerable success, Storymakers will be back bigger and better next year.